I am so thrilled to finally announce the release of my newest pattern! Ever since I saw these fabrics I knew I wanted to design a quilt with them. I fell in love with them when Sweetwater first posted about them on their blog HERE. I mean, what could be more perfect for all of us quilters than fabrics that are named and designed after sewing and quilting motifs?!? With fabrics called "Sewing Guide", "The Bias" and "Pinking Shears" I knew that whatever I designed needed to be classically quilty. Thus ~ my "Sew Classic Sampler"! It was a blast to make and I think this pattern is perfect for all skill levels. It's Jelly Roll and Layer Cake friendly (whoot whoot!) and focuses on some of quilting's most classic quilt blocks. Instructions are included for using pre-cuts or yardage so you can do whatever works best for you! I've designed the pattern to be a 12-month Block of the Month pattern but you can go at whatever pace you'd like if you're doing it on your own. If you're a store owner and looking for a new BOM ~ shoot me an email for wholesale information. Dresden Plates, Granny Squares and Pinwheels (just to name a few). I hope you like it as much as I had fun designing it! I want to announce a FANTASTIC giveaway! The prize package retails at a $70 dollar value!!! 1. First, you must be a follower of my blog. 2. Second, you must leave contact information or have an email address connected to your blogger profile. 4. The giveaway will end Wednesday night and the winner will be announced Thursday morning. So. I think that's it. Thanks for playing everyone. My favorite blocks are pinwheels. What a fun sampler quilt! I love anything with stars, so I'll go with the Ohio Star block. I follow you. Samplers are my favorite, you get to make different blocks and don't tired of the same old thing. My favourite block is churn dash! What a great sampler! I really like the pinwheels and Dresden Plate blocks. How lovely! I'm a follower already. I was tempted to say Dresden plate, but then I really love log cabin. 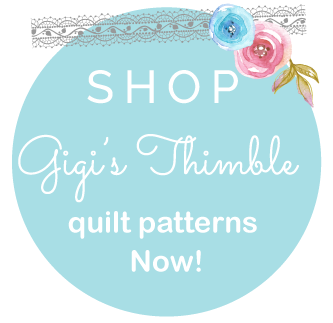 Your pattern looks fabulous - great for all levels, not just beginner. I adore you sampler and my favorite blocks are stars....just about any kind. I'm follower. My favorite block is pinwheels. Your sampler quilt is beautiful!! Oh your sampler is wonderful and the fabrics are just perfect!Love it!! My favourite quilt block are flying geese! I love this - ESPECIALLY a pattern that plays to the precuts! My favorite block is like a favorite song... whatever I happen to be working on. I'm doing a tulip block right now for a baby quilt and am loving it. I was on a 'little houses' kick for a while... before that I was infatuated with pinwheels. Congratulations on your new pattern! I love wonky star blocks. I would like to try out some of the more traditional blocks in your quilt. And I'm already a follower. I am a follower. My favorite block is the pinwheel but recently I have found dresden. They are cute and your quilt is beautiful! The Quilt looks great. My favourite is Dresden. I really like the Dresden blocks with big circle centers. I really like look of the entire sampler. great fabric love the colours, also my favourite blocks are the circle's in centre of the quilt. Your sampler quilt is lovely. I'm a bit boring and love the simplicity of squares! Not that I don't love other blocks. I am a follower of your blog. Thanks for the lovely giveaway. I love your new quilt! I follow the blog and am happy I do. Love the fabrics, love the patterns, love the quilt. Leaning toward the Dresden Plates as my favorites. Love the quilt - and those fabrics are divine. I am fond of pinwheels and 4 patches. I'm a follower. And I really love this quilt and these fabrics! Sweetwater is just my favorite whatever they come out with! One of my fav blocks is pinwheel. I love the Dresden block..and the Log Cabin....but to tell you the truth; I don't actually know my favorite. I like so many!! Thank you for this chance. Very creative!! I love your take on a more traditional quilt style (my favorite block, BTW, is a traditional star, or whatever you want to call it) with a twist...modernish (if that's even a word!) fabric! I've wanted Sew Mama Sew from Sweetwater for so long, but it's always out when I go to various LQS's. I sooo want to make my wonderful MIL a quilt from this fabric! Wonderful job!!! Bravo!!! Simply beautiful!!! That is absolutely stunning!! I LOVE the fabrics and all of the blocks you used to make it. My favorite block in a sampler like that has to be the pinwheels. They give so much movement to the quilt. Beautiful quilting too!!! I've never done a quilt like this one, but I'd like to try it! Your work always inspires me! What a great quilt for beginners, and all those blocks to learn from! Favourite block is granny squares, just love them. Love the quilt and what a perfect name for it! You are in my blog list too. One of my favorite blocks are log cabin or anything with stars. I do follow.Thanks for the giveaway. I really like this sampler quilt. My favorite block is any kind of star. I also like the log cabin and tumbler blocks. I'm a follower, and I love what you have created with this new pattern. My all time favourite is the DRESDEN. It's just timeless, always look wonderful in ANY range of fabric. Thanks for the opportunity to win this beauty. If I'm lucky enough to win, I may just be inspired to finish it this year!! Gorgeous quilt....so many blocks I have never tried! Love the fabric and the chance to win! I am a happy follower and my favorite block has got to be Log Cabin! Love this quilt! I just finished piecing a Farmer's Wife sampler in reproduction fabrics & I would love to do your modern sampler with those beautiful Sweetwater fat quarters! Love, love, love Dresdan's and Log Cabin blocks!!!! And, I am already a faithful follower!!!! Oh wow! I love this and the fabrics you chose! My fav quilt block is the Dresden, which I'm loving this pattern. Hi Amber I love the quilt and all of the blocks look super done in Sweetwater fabric. I am a follower and my fav is Dresden Plate. Thanks for the chance to win. HI! LOVE THE PINWHEEL BLOCK! IT WAS THE FIRST I MADE AS A BEGINNER AND I STILL LOVE SEEING IT MADE. HAPPY TO FOLLOW YOUR BLOG! THANKS TO YOU AND SWEETWATER FOR A BEAUTIFUL GIVEAWAY! I read your blog all the time it just now signed up to be a follower. I love, love Mama Said Sew fabric and now I love, love your perfect sampler pattern for this fabric too. My favorite quilt block is the Pinwheel. Thanks so much for the chance to win your pattern. I love Dresden Plates and stars - not sure I could pick between the two. This quilt has both. I love saw tooth star block, and I am also a follower. Congratulations on publishing such a great pattern! Great pattern! Love all the different blocks. I have a strong leaning towards star blocks...and really any star blocks! This quilt is awesome! I recently finished a king size quilt for my daughter by sweet water and fell in love with their fabric designs. The pattern you have compliments their fabric and would gonzo well in my bedroom. Red is my favorite color and I have custom curtains I made that would go perfect with your quilt. I love the log cabin, and the Dresden plate is a close second. This is a beautiful sampler, I think because of the limited color scheme. I am also a follower. I follow your blog! I love the Ohio Star--mainly because it's my home state. I adore the fact that you made this quilt to be a BOM. I readily admit it would intimidate me to try to take it all on at once, thinking about doing it one block a month makes it so much less scary. It's a beautiful quilt--great job! I love sampler quilts. Stars are my fav. These fabrics are so sweet too. Oh wow! What a great prize. I really like your pattern. The Dresden plates are fabulous. A favourite of mine. Your quilt is beautiful and I love the colors and fabric choices. My favorite block is the pinwheel. It's beautiful! I meet all the criteria for entering...so exciting! That fabric is lovely too. Thanks for sharing. I really love wonky blocks...I can't say I've got a specific one, but any block you can twist and turn, so that it doesn't matter whether or not it's perfect sounds good to me. I'm also really loving Granny blocks...and I plan to make a quilt of my own...the cutting has begun, but progress is slow. =) Thanks again. Your sampler is breath-taking and classy!! My favorite block is the pinwheel, it is simple and fun! I am a long time follower! I am a follower, but picking a favorite block is difficult. I love applique of all sorts, I love log cabins and the variations of it; plus I love any type of star block. I can't pick just one block. My favorite blocks are stars, not very original but always make me smile. And your red, white and black quilt is wonderful. The solid black horizontal sashing it brilliant. Congratulations. It's gorgeous! I'm partial to dresden plates. Your pattern is awesomely fabulous.Good for you! I love your quilt! My favorite quilt block is the Dresden. :) I'm a follower too! My email is kkking69 at yahoo dot com. What an amazing sampler!! I love that fabric!! Thanks for the giveaway! Beautiful sampler quilt, I love all the blocks you showcase, and the fabrics and colours you used are lovely. My favourite block at the moment is a star in a star block or any stars. What I love about your sampler is that there are so many different blocks to learn new techniques. Thank you so much Amber for a chance at the give-away. I am definitely a follower! I have to say your pattern is one of the nicest I've seen. The various blocks are exciting & the fabric is fabulous. One of my all-time favourite blocks is the pinwheel. I find you can do so much with just that one block! I love all star blocks. Thanks for your generosity! My favorite block is anything with stars! Star blocks, even star fabrics. This sampler pattern with these fabrics is really great. Great design! I love your quilt! My favorite block is the hourglass block. I also have to agree with you that Mama said sew is an awesome fabric line. Who could go wrong with a quilt made out of black, red, and white! Excellent job on this pattern! I am a follower, and my favorite type of block is anything that is English paper piecing. I love doing my work by hand. When I work with my machine, and directions, I tend to do a lot of work with my seam ripper as well, LOL. Plate. I'm already a follower of your blog. Thank you for the opportunity to win your fabulous pattern and great fabric! Love the quilt. You really did a great job with the patterns and fabrics.My favorite block is the Dresden but like several others.My email is dhutson454@comcast.net. Thank you. Gorgeous sampler! I love red in quilts~ and samplers~ and stars!! My all time favorite blocks are always star blocks. You have a winner! I'm a happy follower~ thank you for the chance! What a great quilt! Maybe this will be a future project for my long distance quilting partner and I to tackle. My favorite blocks are pinwheels. Wow, your Sew Classic Sampler quilt is beautiful!!! My favorite quilt blocks are stars and pinwheels. Your sampler is just wonderful! I fell in love with this fabric when it was first showcased, too. My favorite blocks are pinwheels and log cabins. I love your sampler quilt - it's beautiful, and the fabrics are so beautiful - I love how their contrast accentuates your blocks! Your sampler is beautiful! My favorite quilt block is a Dresden plate. Hi Amber! My favorite quilt block (if I have one) would be the log cabin. It was the first one I made 23 years ago. I love your new quilt! I have always wanted to make a black/gray and white quilt with a little splash of color (red is my favorite color). And the polka dots...well...I think every quilt should have some polka dots in it somewhere (I try to put some in every quilt I make). They are so happy! Thank you for sharing on your blog. Sounds like you are a busy mom! Love, love, love your sampler pattern. I have a little bit of Mama Said Sew that I have been saving and this would be the perfect use! I follow your blog, have my contact info on my blog profile and my favorite block is the Dresden Plate. The fabric is pretty sweet as is the sampler, well done!. I'm a follower and I really like Dresdens. Modern and traditional all at the same time. I love it! Beautiful quilt and great new pattern:) my favorite blocks are stars and I'm already a follower. Love the quilt.You really did a great job with the patterns and the fabrics. I'm a follower and I like the Dresden but like others too. My email is dhutson454 at comcast.net.Thank you. I love that quilt! I really want to make it! Lately my favorite block is the granny square. I follow you on blogger. Love the new pattern. I too love this Sweetwater fabric line. my favorite blocks are star blocks. I like the sashing you selected for your pattern. thanks for the opportunity to win. You did such a perfect job, the quilt is fantastic...it really displays the fabrics well...I would love to make one myself...thanks for the chance! I love your sampler. I am a follower and my favorite block is the square in a square. I am a follower. I love your star blocks with the pinwheels in the middle, if that's what they were. I'm a newer quilter. When my husband saw that fabric he asked what in the world would you do with that fabric. I'll be showing him bright and early, and I can guarantee he'll love it. He loves pieced quilts, and is a quilter too. He just has no imagination. My e-mail in case in cdahlgren at live dot com. Love, love, love, your quilt. This is so beautiful ! Really like your pinwheel, I follow by e-mail. My favorite block is the pinwheel. I love your design and the fabrics! I am a follower, and thanks for the giveaway! Love your sampler. I've been wanting to sew a black/white/red quilt. My fave block is Dresden Plate--I think because of the applique. Thanks so much for the contest. I was drawn to your blog when I saw your Sew Classic Sampler on Pinterest! I loved the sweet dresdens immediately and then realized you used Sweetwater's Mama said Sew fabrics, which I just discovered a couple days ago and also fell in love with! I love your new sampler pattern. It looks incredible in those fabrics. My favorite quilt block is the Ohio Star. I'm a follower. What a fantastic quilt! Congrats on this lovely work. The blocks I like best are nine patches and HST in different settings, stars, pinwheels, etc. I like a lot that you sew simple items and can arrange them to so many patterns. I am a follower and I LOVE the sampler quilt and the fabric you used....I love star blocks, and dresden plate, and log cabin, oh heck I love any type of block....I have only been quilting for a couple of years and loving it!!! I LOVE a good star block. A star sampler is on my list! And Mama Said Sew sure is perfect for a sampler quilt like your's! I have been a follower for a long time, because I love your creations! My favorite block is Dresden Plate if I have to choose, but I like them all very much! Thanks for the chance to win this great gift! So cute! Live red white and black. Thanks. I'm a follower. My favorite block is 'Log Cabin' because you can make it so many ways. I love the colors in your sampler! My fav block? Sawtooth star! Love them! I am a follower. Love your quilt. Soooo pretty. I am a long time follower of your blog! Your new patten is gorgeous! I am very partial to traditional blocks like Dresden Plate, Churndash and Ohio Star! Made in modern fabrics and you can't go wrong! I subscribe to your blog. Yay, I can enter the give away. :) I have a hard time choosing a favorite block...stars, churn dash, dresden plate? And I LOVE the fabric you've chosen. I am a follower :) Love your sampler - I have NEVER done paper piecing..now seems like a good time to try. My current favorite is log cabin in the courthouse steps setting. I love the way you have taken this fresh fabric and used it with traditional blocks. Thanks for the giveaway. I follow your wonderful blog and I love your new pattern and the prints you used in it. It looks like a great sampler quilt. 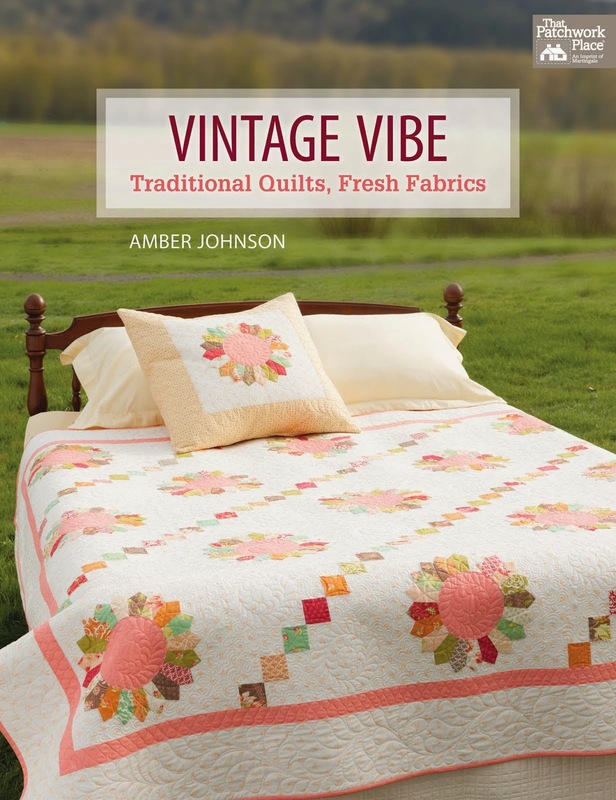 Oh Amber I love your new Sampler quilt, very classy... The fabrics are just gorgeous. Yes have been a follower for sometime but then I like allot of what you do. Thanks for the chance. Love the new pattern. Classic with a modern twist. Looks great. I would love to win a copy. My favourite block is anything with a star in it.. Thanks for sharing and for the opportunity on the draw. I love the Dresden plate - so many variations with that now. I also LOVE your sampler quilt with that fabric line. Wonderful giveaway, thanks. I adore your Sampler Quilt..I love the Dresden plate as you can make it different sizes and it's Appliqued,,My therapy for hand quilting,,Be Still My Heart.. I'm definitely a follower. Love this pattern. Your right that it looks like all skill levels will be able to do this considering I'm pretty new. So far my favorite block is Cathedral Windows. I've only made 1 pillow with it and it was a gift but I love the looks of it. Thanks for the chance to win this giveaway! You are right, this IS an AWESOME giveaway. Favorite block: the granny square. Your quilt is just breathtaking!! I am a follower too! What do I like about your sampler? Everything. I especially love the color scheme (my school colors) and, don't laugh, the setting. Samplers often are set with a consistent setting block or unpieced square or they're done with sashing around every block. I love that you set the blocks in columns with sashing between. I like that you repeated several of the blocks to make the sampler look a bit less like a sampler. Fabulous job. I love the variety presented in your sampler. There are some blocks I've done and not perfected (pinwheels) and some I've never done (dresdens)! I'm eager to dry them all. Your quilt is positively striking! I love your sampler and your choice of fabrics. I love Dresden Plates, no matter what size, I just love them! This looks like a wonderful quilt to make and beautiful fabrics. Thanks for such a great giveaway. This is a great pattern. I have 2 favorites--Dresden and Hexagons. Thanks for the wonderful giveaway. Your new sampler pattern is just simply stunning! It is incredible how fresh and modern-looking it is done up in these black and white prints. I have been a faithful follower of yours for some time now. I do look forward to all your great ideas. I am a follower. I love to see what you have done. That is one of my favorite fabric lines! Can't make up my mind if the granny block or the Dresden Plate are my favorite. Oh heck the quilt is my favorite! Eye catching! The border does what it should do stop your eyes and bounces them back to the quilt though it would not be my choice. My favorite block is what I call the Sunflower. Never put multiples like you have. I am looking for this pattern. Thank you for showing us. Love the new pattern! It has such a nice variety. My favorite block is the square in square block or the star block. Thanks for the chance to win...beautiful. Love your quilt. Those are my favourite colours. I have many favourite blocks ... pinwheels, log cabins, dresdans ... to hard to pick one. I am a follower via email. Thank you for the chance to win. thank you so much for this giveaway, your pattern is adorable, by the fact that has pinwheels my favorite block and log cabin too, or similar? Love your Sew Classic Sampler! I have wanted to make a red and black quilt for sooooo long but couldn't get the fabrics to work. Seeing how you added the grey tones - perfection. I would love a sample of theoe fabrics to work with. Please pick me to win - I'm inspired! As usual, you've created another winner! Love the fabric, too! I'm a faithful stalker (Oops, I mean follower) who just loves your patterns. As a matter of fact, I'm teaching the Twisted quilt in May at a LQS and am so very excited. I've made two versions already and have picked fabric for a third because the others are spoken for after the class. Anyway, my favorite block would probably be anything starry. Thanks again! Your quilt is fabulous. I love the Dresden blocks. I am a follower!! I love your blog Amber. And the pattern is amazing. Love how you use different blocks and different piece methods. I really can't decide on a favorite block but I am leanig towards swoon. Thank you for the giveaway. Love your pattern & the fabric. I'm a follower who loves log cabin blocks. Thanks for the great giveaway. What a beautiful sampler quilt! I love any kind of star block, love the one with the pinwheel in the centre. I a a follower. I'm a follower (psychdog) and I love the pinwheel block. This quilt and fabric are amazing. This looks awesome Amber! I run a BOM program at our local quilt shop and this might be next year's project! I love how you have incorporated so many different techniques into one quilt. If I had to choose a favorite block, it would be a tie between the Dresden plate and the Star block with the pinwheel in its middle. I'm really excited to see your new BOM quilt! Love the fabric, love the quilt. My favorite block is still the very first one I ever made...Churn Dash. I'm a follower and thank you for the chance to win. I have seen many quilts made of this fabric line, the different combinations continue to amaze me in the way it can change the feel of the project. The combos you have you used are lovely, the dresdens are my favorite. I live in CA, but today I will be visiting the quilt shop in CO that this line is named after. I follow your blog, I love every line of fabric Sweetwater has designed - I am a true fan. Flying geese and log cabin are my favorite but then pinwheels are right up there too. I truly enjoy the fabrics you're using. Very lovely. I'm finally getting into the "grays". Taken me awhile but once it grabbed me I'm off and running! First I am defintely a follower of your blog (& love it). I love your sampler and the colors of this line are awesome, I am partial to the pinwheel block, my fav. Amber this is beautiful! I love that you did whole rows of some blocks it gives it some order. My favorite block is Dresden plate and lately Churn Dash has really caught my interest. I have been a follower of yours for quite a while. I absolutely love your sampler pattern and what a great fabric choice - Mama Said Sew is such a favorite of mine! My favorite quilt block would have to be either a star block or Churn Dash. Thanks so much for the wonderful giveaway chance and congrats on the fabulous pattern. Your sampler looks amazing... So many cutes and fun blocks. My favourite block is probably the log cabin, but I also love granny squares, the churn dash block and the carpenter star. Thank you so much for a wonderful giveaway! My favorite block is Bear Paws ( at least I think that's what it's called). I love your pattern and the color scheme.Thanks for an opportunity to win. And I really enjoy your blog. I love the sampler, especially in the fabrics you chose. It has all the charm of a traditional quilt, and a modern twist. And it's complexity keeps the eye moving.If a person walked into a room with that quilt in it, they wouldn't be able to take their eyes off it. My favorite block is drunkard's path. I love the contrast of curved and straight edges. Thanks for the giveaway opportunity. What a striking quilt. Absolutely beautiful and love the colours you used. My favourite block is the Dresden Plate one. Thanks for this wonderful giveaway. Wow! I looove your quilt! The fabric line is perfect for this quilt! My favorite block is Pat's Star. It's really nice with a star in a star! My favorite block is the scrappy trip around the world right now. That changes every time I learn a new block so it is hard to say what it will be next week. I belong to a block of the month class and we learn new blocks every month. I would love to make this sampler quilt and the fabric choice is awesome. Oh, I am a follower of your blog. Your sampler quilt is beautiful! I am a follower. My favorite blocks are stars I think, hard to choose. Thank you for the giveaway!! Wow, that quilt is so SO beautiful! I am kinda a beginner, I have been quilting for about a year now and I must tackle this quilt! Amber, it is awesome, you rock!!! And thanks for this awesome giveaway, I so want to win this! This is a great pattern. And I love the fabric line. Thanks for the chance to win. I never thought about a favorite block, but thinking at what I've worked on I gravitate toward stars. I am a follower. I love it! Sampler quilts are best, I lose interest easily making a billion of the same block. This is perfect! I think my favorite block would be the bear paw. Hands down. Or would it be paws down! Sorry, I am easily entertained. Your quilt is a beautie. I love it! You are so blessed to be so creative. A star block in any form is my favorite block. My favorite is the LoneStar block! Especially scrappy!! My favourite block is a Churn Dash. I've been holding onto a Layer Cake of this fabric, just waiting for the perfect pattern to come along and I think this is it! I can't wait for it to start! LOVE your Sampler, my favorite blocks are anything with a star, can't really narrow it down more than that, and if they are paired with Log Cabin blocks I'm truly in love.LOL!!! I really like friendship stars. Thanks for the awesome giveaway. I seriously love this quilt. I love star blocks, especially the Ohio Star block. I LOVE your sampler quilt! Thanks for the chance to win! What a wonderful sampler pattern and quilt! I love Mama Said Sew fabrics - these are striking in this quilt. I follow you through Google Reader and love to read your posts. I really like the granny squares! My favorite is the log cabin. I LOVE the fabric in this quilt! I've been thinking about sampler quilts for the past couple of days. I think that would be a good place for me to start. Try out different designs and such without creating a whole quilt out of one design. This would be perfect. Awesome. I like the dresden style. So pretty. I follow your blog! I love your sampler quilt, I have more sampler quilts than anything else, and mostly star blocks! Well, yes I do follow your blog. I love your sampler quilt. My sister and I just did one at the same time, same fabrics but didn't show each other until we were done. It was so much fun. I really like anything by Sweetwater and the Mama Said Sew is fantastic. I don't have a favorite block, but enjoy doing most anything modern or scrappy. Thanks for the giveaway. My favorite is a Dresden Plate. I love your sampler quilt. Thanks for the giveaway. What a stunning quilt! I LOVE the pattern. And I love it done in the Sew Mama Sew fabrics. It's perfect and a fantastic giveaway. I especially love the dresden blocks. And yes, I'm a follower. My favorite block is ... anything that looks complex but is actually super simple. I can't think of a specific block off the top of my head. I have two favorites that are not often found in samplers. I love log cabin and drunkards path. It always amazes me how many layout designs these blocks can make. I do see a courthouse step in your sampler. I love your color combination and your layout. They make the blocks go together. I am a follower. I'm a happy follower! I love star blocks, pinwheels, things that use triangles. I also love anything Sweetwater and think your sampler looks amazing! Thanks for the chance to win. My favorite quilt block is Dutchman's Puzzle, which you used in your beautiful sampler quilt. I would love to win the quilt pattern and fabrics so I can make one just for me. The new pattern is fun! Samplers are my favorite because of the variety. I am most eager to try a Dresden block - as a newbie, I've not yet attempted one. I follow your blog via email (myluckynumber13 at hotmail). I'm a follower on Reader and a lover of stars, any star block will do! Your BOM looks wonderful and I like that the blocks are traditional and look great with Sweetwater's fabrics. Win! Win! I love the dresden plate. I've always wanted to do a quilt with black and white. Then with the red, perfect. I love pinwheels and log cabin blocks and I love love love this sweetwater fabric. Your Sew Classic pattern is perfect for this fabric so thanks for the chance to win the pattern! Hi! LOVE this quilt! GORGEOUS! I am a follower and I really like Log Cabin. Oh my...so beautiful. I love star blocks, Dresden plates and tumbler. Wow. Your sampler quilt is gorgeous -- love the colors and variety. I just became a new follower. I am a follower, I love your new pattern. My favorite block "right now" is the Lone Starburst block. I just completed 6 of them for a online quilting bee! The quilt is beautiful. I am a follower and I love pinwheels and all variations of that pattern. I'm not eligible to win, but I did want to complement you on your quilt. It's gorgeous and yes, those colors are fabulous together! I seem to be loving the traditional block a lot more. But I add a little modern to them through the fabric and the quilting. I follow you the email. To be sure my email is sharshawns2(@)gmail(dot)com. Thank you for this chance! This is so great! I really can't decide on a favorite, they are all just so lovely. But if I HAVE to pick, I say the Dresdens. I follow your blog by email. Great job on this, I love it! Personally, my favorite block is the Maple Leaf, but I've made very few of them because there are so many other wonderful blocks!!!! 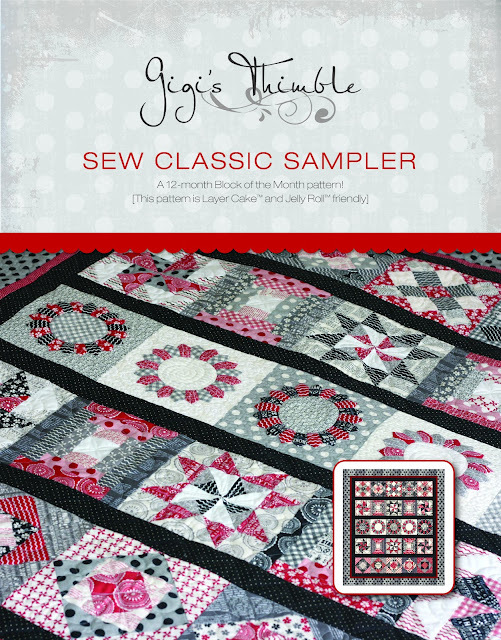 I love the Sew Classic Sampler and to do it in the black white and reds is awesome! 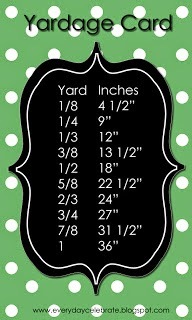 I have a new grand daughter coming and the nursery is in those colors, so I may have to snag some of that fabric! Love this quilt. Everything about it! I am a follower and love all of your patterns. They are all on my birthday wish list for this year. Thank you for the inspiration! 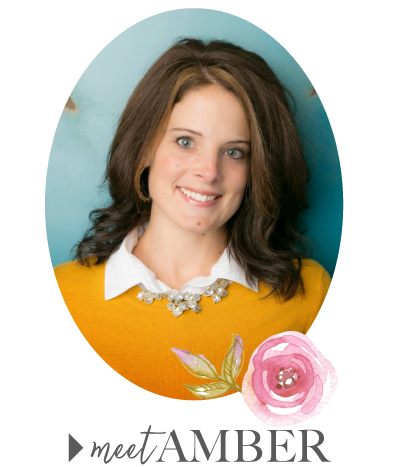 Amber, I love following your blog and I always look to see your newest Pins on Pinterest. Congratulations on your newest pattern. I think it will be a big hit! BTW I love granny squares! I'm a BRAND new follower! I LOVE the pinwheels. I would also love to get my hands on your pattern because I am excited to learn some new techniques. And Mama Said Sew is amazing! Your quilt is stunning, classic blocks, but the fabric/colour choices make it seem so modern, beautiful! I'm already a follower and my favourite blocks are anything with stars or pinwheels... thanks for a wonderful giveaway opportunity. Amber your quilt is fabulous and you chose the perfect fabric. My favorite pattern is the saw tooth star. It is very versitile. I follow you via email. I love log cabins - so versatile! I love your sampler, great mix of traditional and modern! I follow your blog. I love pinwheels! They are definitely my favorite. And I love this Sweetwater fabric too. Thanks for the chance to win. I love the colors in your quilt. . .course red anything makes me happy. I also like how you grouped the blocks. Favorite block is a star although, my friends would say my favorite block is a pinwheel because I am always making them using up "trimmings" from other block projects! I just googled FWS paper piecing and found your blog. Wow, can't believe I haven't seen your patterns before, awesome. Definitely a new follower now. My favourite block right now is the windmill, because that's where I'm starting with the FWS. Love the blocks in your Sew Classic Sampler, I would love to win the pattern and thankyou for the chance.